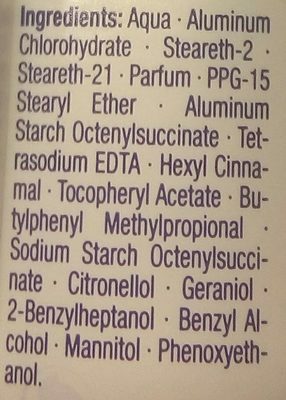 Aqua, Aluminum Chlorohydrate, Steareth-2, Steareth-21, Parfum, PPG-15 Stearyl Ether, Aluminium Starch Octenylsuccinate, Tetrasodium EDTA, Hexyl Cinnamal, Tocopheryl Acetate, Butylphenyl Methylpropional, Sodium Starch Octenylsuccinate, Citronellol, Geraniol, 2-Benzylheptanol, Benzyl Alcohol, Mannitol, Phenoxyethanol. Product added on September 11, 2018 at 7:00:09 PM CEST by olofolleola4. Last edit of product page on December 29, 2018 at 6:38:12 PM CET by olofolleola4.